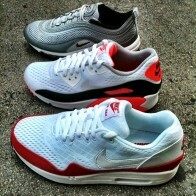 The future of Air Max by Nike Sportswear. The Classic Air Max 1, 90 & 97 get updated with some very cool Engineered Mesh. The collection is available in our store or by phone now. Call 305.534.1253 to place phone orders.